Starting with a quick recap and introduction gave me the perfect amount of information to not feel lost in this first for me story, while never stepping over the line of too much information. Hechtman has a light touch with her prose: she presents each character with clear purpose, giving them a voice and presence from the start that serves as a base from which to build. Casey is a relative newcomer to Cadbury by the Sea, after her mother’s despairing of her ever sticking with any place or career. Well-known as a pastry chef, she’s now on her 3rd yarn retreat, and seems to be really enjoying the process and settling in. Her bestie, Julius the cat, seems to enjoy his life now as well: serving as both companion and sounding board to Casey’s every thought. Together the two have formed a unique partnership; Julius’ lack of speech allows Casey to sort through the details as she works to solve problems. Two mysteries are wrapped in this story. The first is the ongoing search for the now grown woman, daughter of the original owner of the resort Vista del Mar, and niece of Margaret. Casey’s friend. This mystery here is an ongoing on, dropping in and out throughout the story, and allowing the friendship between Casey and Margaret to have moments that are clever and fun, and give us insight into Casey’s personality and curiosity. But, there has to be some conflict, and this begins with a Best of 1963 gathering at Vista del Mar, taking up much of the facility’s space and coming with it’s own unique restrictions. Casey’s Yarn Retreat is also scheduled, and the two groups need to shuffle, compromise and even share moments within the resort to make it all work. When the ex-wife of the leader of the 1963 party is found dead, with scarves used in an opening act / magic trick, and discovered by Casey the story really starts to take flight. Casey’s friends, from the men vying for her attention, through Lucinda and others, and even the subtle and not so barbs from her mother have a place. Unique and rather eccentric moments (1963 clothing, speech, music and technology) add to the fun of the story, and the mystery bags for participants in the yarn retreat are all woven into an eminently readable and satisfyingly intriguing and twisty mystery: dancing on the edge of ‘too much’ but never flying over the cliff. Reasons for the who did it and why are clearly explained, after several miscues and misdirected moments as the clues are sorted out and brought to light, as well as another few moments of insight into the ongoing thread of the mystery woman. Easy to pick up, this is a perfect story for fans of yarncraft and cozies, although one doesn’t need to understand or know how to work with yarn, even as you will want to try it. Narration for this title is provided by Margaret Strom, and her broad, middle American accent suits the characters, if not wholly embracing the different nuances that exist in the regions of the west coast. There weren’t any large missteps, but there also weren’t any moments that stood out as exceptional: and while that isn’t a bad thing, there was more emoting that could have been present to pull emotions from the readers, pauses used more effectively to imbue tension in moments that called for it, or even gave the moments of regroup or pondering some more weight. It wasn’t a bad performance, and I won’t avoid an audio title from this narrator, but I hope that truly enjoying the story that she is presenting becomes a more apparent trait for Strom. Overall, this was an interesting story with plenty to love – and who knew that there were such things as “yarn retreats’ where you can perfect, explore and experiment with all things yarn? “This time it’s going to be different. This time I’m prepared. I know what the retreat is about. No more depending on one person to lead the workshops. And I have help with the other stuff, too.” I looked at my audience to see his reaction. Julius, my sleek black cat, blinked his yellow eyes and jumped down from the bathroom cabinet. Did that mean he didn’t believe me? I put away the toothbrush and gave myself a last look in the mirror. Did I believe myself? What I said was true. I was definitely better prepared than I’d been for the first two retreats. Wasn’t I going to a meeting with my two workshop leaders this very morning to go over the final details? But me putting on yarn retreats? It’s not what I-or anyone who knew me, especially my mother – would have expected, given my rather spotty career history. A semester of law school was enough for me to know that being a lawyer wasn’t for me. I’d tried being a teacher, actually a substitute teacher at a private school. I did it for a couple of years and then I’d had enough. I baked desserts at a bistro for six months. I would have stayed longer but the place went out of business. Then there was the temp work. At least it wasn’t boring. I gave out samples of new products on street corners in downtown Chicago and spritzed perfume on shoppers in several department stores. The best of the bunch was my time at a detective agency, where I was either an assistant detective or detective’s assistant, depending on who you were talking to. If you were talking to me, the title would definitely be assistant detective. Mostly what I did was phone interviews, but I loved it. Everything might have been different if my boss, Frank, had been able to keep me on. But you can’t change the past. So, in an effort to make a fresh start – that means when the temp work dried up, I’d had to move back to my parent’s apartment in the Hancock Building and I needed to get out of there-I had relocated to my Aunt Joan’s guest house almost two thousand miles away on the edge of California’s Monterey Peninsula. In no time, my aunt helped me line up a gig baking desserts for a local restaurant called the Blue Door and making muffins for the assorted coffee spots in town. With the chilly temperatures and almost constant cloudy skies, coffee spots were a big deal in Cadbury by the Sea. So how did I end up putting on yarn retreats? Yarn2Go was my aunt’s business, but just months after I’d moved into her guest house, she was killed in a hit-and-run accident. She left everything to me, including her business. The next question is usually what is a yarn retreat? The yarn part refers to yarn craft, which so far has been knitting. I can practically see my mother’s eyes flying upward at the thought. She’s a cardiologist and it’s pretty clear she thinks this apple has fallen very far from the tree. Her favorite line seems to be “When I was your age (35), I was a doctor, a wife and a mother. And you’re what?” It helps her case that until I inherited the business, I didn’t know which end of a knitting needle was up. Now after two retreats, I definitely know about knitting needles. Mostly that I don’t really like the ones that are long and come in pairs. It’s circular needles all the way for me. And although I can’t knit as well as the retreaters, I’m holding my own and have samples of my work to prove it. And every time I finish something, I e-mail a picture to my mother. Yes, I might have an issue with proving that I can stick with something and finish it. And it might be obvious I have a few issues with my mother. On the other hand, there is my father. He’s a pediatrician and much easier to get along with. Of course, that could be because his patients are still in their formative years and he looks at me in the same way. That covers the yarn part of the business. Now for the retreat part. It’s really a vacation with a purpose. My group gets to learn something new and has lots of time to hang out with other yarn lovers while they work on their craft. They also get to enjoy the other activities put on by Vista Del Mar, the hotel and conference center where the retreats are held, conveniently located across the street from where I live. My impression of cats pre-Julius was that they were aloof and didn’t really have a lot of interactions with their humans. Julius had made his presence felt from day one, and as the weeks had turned into months, he’d become my shadow when I was home. My aunt’s creations were all over the little room. My favorite was the crocheted lion that guarded the desk. Julius jumped up on the small love seat and curled up against another of my aunt’s creations, a granny square afghan. How lucky that the bright colors were in the middle of the motifs with rows of black yarn around the edges. All that black yarn camouflaged the cat hairs Julius so generously deposited. He watched as I picked up the red tote bag with Yarn2Go Retreats emblazoned on the front. This bag and its contents were a sample for the upcoming retreat. I emptied the contents to look them over once again. There were several large skeins of yarn and then a number of smaller balls of yarn. All of them were in different colors and textures. A small plastic bag came out as well. It contained an assortment of beads and charms. “We’re calling this retreat Mystery Bags,” I said in case Julius was interested. The plan was that each bag would have a different selection of yarn and embellishments. I put everything back into the red tote thinking about the upcoming meeting with my helpers to go over the plan for the projects. A large manila envelope fell off the desk as I picked up the tote bag. How many times had I emptied this envelope, looked at the contents and wondered what to do? The photo of the infant with a teddy bear was old and the colors faded, but I was certain the baby was a girl by the bow in her wisps of hair. A small white envelope had Edmund’s Hair written across the front. Inside there was a clump of shiny dark hair with the roots still attached. Another much older envelope that had been sealed and opened had Our Baby written in faded ink. At the bottom Mother’s DNA was written in fresh ink, no doubt referring to traces left when the envelope was licked to seal. And last was the ledger sheet from the long closed Cadbury Bank. It was marked as a sign-in sheet to access safety-deposit boxes. What made it noteworthy was the fact that Edmund Delacorte had signed in for Box 273, and then a few lines down Mary Jones had signed in to access the same number. Why did this matter all these years later?…. Her love of mysteries started with Nancy Drew and blossomed when she began to read Agatha Christie's books. She has been doing handicrafts since she was a child. 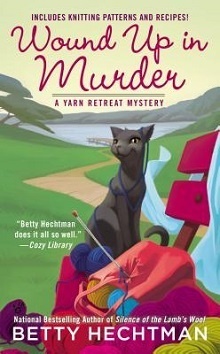 It is like a dream come true to be able to mix mystery and yarn craft in her books.